Hailed by Bill Clinton as one of the world's greatest living saxophonists - the president is a player himself - Igor Butman is an icon of Russian musical life. Born in St Petersburg in 1961, he started playing at 15 egged on by his jazz-loving father, a musician who worked by day and gigged by night. "My father told me about jazz. I hadn't actually heard much, because I'd been listening mostly to Soviet pop, but my dad was an amateur drummer and singer who often played at weddings and in restaurants," Butman explains. "He was really the person who got me into jazz music, and music itself." Jazz in Russia goes back to the 1920s. According to Butman, it has been through various blurry periods of development, as well as confusion with classical music. The Soviet regime's strict control of artistic liberty presented both opportunities and challenges. "As soon as I started playing," says Butman, "I was able to perform in jazz clubs around St Petersburg. I travelled to places like Moscow, Latvia, Lithuania and Ukraine, but I wasn't allowed to go abroad because they thought I might escape. "In Soviet times, the state-owned booking agency would provide you with concerts - it didn't matter if you sold out or had two people in the audience, they would still get you 14 concerts a month." Despite supplying a steady stream of work, this closed system placed considerable constraints on creativity. "I put together my own band, but I couldn't get a job as I wasn't in the state booking agency. It wasn't easy to get professional status and be able to travel. So I decided to go to the United States and try the normal way." In 1987, Butman arrived in Boston to study at the famous Berklee College of Music. "I was the best in the Soviet Union and I knew my limitations," recalls the saxophonist. "I had to study, play and be in competition with the best in the world. After graduating, I moved to New York for a few years, before coming back to Russia permanently in 1997." On returning to Moscow, Butman's career really took off. He began to establish himself as the leading light in Russian jazz, recording several CDs - including his most recent, Magic Land, which features theme tunes from Soviet cartoons and an elite group of American musicians. Russia's jazz scene today is a far cry from its state in the former USSR, when you could be thrown in jail for holding unauthorised concerts. Butman is quick to acknowledge how "everything has changed", especially in terms of healthy competition in the musical world. "It's a harder life for us in a way. There's a lot of competition between groups, which I like. You have to keep improving, provide something interesting and unique and think about what you can give to venues or concert halls. "Now there are a lot more good young musicians. Things are happening all around Russia - every town has its own interesting scene. It's not only Moscow, but Novosibirsk, St Petersburg, Vladivostok, Rostov-on-Don, Yaroslavl. There are also a lot more jazz clubs competing, and they are able to bring in the best musicians from all over the world." The sense of anticipation when a big act hits town is exciting for Butman, who has been organising his own jazz festival for nine years. "It's called Triumph of Jazz. I'm trying to find new names and give them the opportunity of playing here, as well as bringing old stars who made a revolution in jazz. "I think there's a big market for that in Russia. People are interested in jazz, and they've heard about me - they can put trust in what I'm going to play or the people I'm going to bring, even if they don't know who it is. There's a big sense of curiosity, because it's not every day we have something so special. A lot of different people come to the concerts." 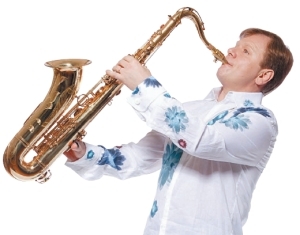 Butman's status as something of a jazz celebrity in Russia has built up from numerous angles, not least his powerful and distinctive voice on tenor saxophone. In addition to running a club and the Triumph festival, he also hosted Jazzophrenia on national television. Most recently, he embarked on an ambitious eight-concert US tour with the Crossover Concerto, a collaboration featuring classical maestro Yuri Bashmet and the composer Igor Raykhelson. "We have my big band and a chamber orchestra, the Moscow Soloists, conducted by Yuri Bashmet. It's a combination of different music: they play classical pieces, with a little jazz influence, and we play some classical in our jazz way. It's challenging, but it sounds so good - for us it's just incredible." The current vitality of Russian jazz receives no better endorsement than the fact Butman does not see a reason for returning to America: "I don't have to live there. Of course I really liked it, but I like to live in Russia just as much." Constantly sold-out gigs indicate the feeling is mutual. Jazz was first heard in Moscow on October 1, 1922. Poet, choreographer and musician Valentin Parnakh's band drove the capital mad for it. In 1926, renowned saxophonist Sidney Bechet appeared at the Moscow Music Hall and the city soon soon had its own jazz orchestras. Many foreign jazz musicians played in Moscow and some stayed for years. In the 1930s jazz was considered an ideologically progressive art "of proletarian origin". Jazz orchestras were invited to the Kremlin, while the Mosfilm studio made movies featuring jazz bands. During WWII, jazz orchestras participated in concert programmes for the military, while notes and phonograph recordings were exchanged with the United States. In the post-war period jazz became a "persecuted" genre, but continued to exist. When the thaw began in the mid-Fifties, orchestras appeared with fresh swing-style approaches. Moscow's 6th World Festival of Youth and Students (1957) marked the beginning of contemporary improvisational jazz. In 1960, Moscow's Jazz Club opened with a performance by a quartet from New York. The first Moscow Jazz Festival took place in 1962.